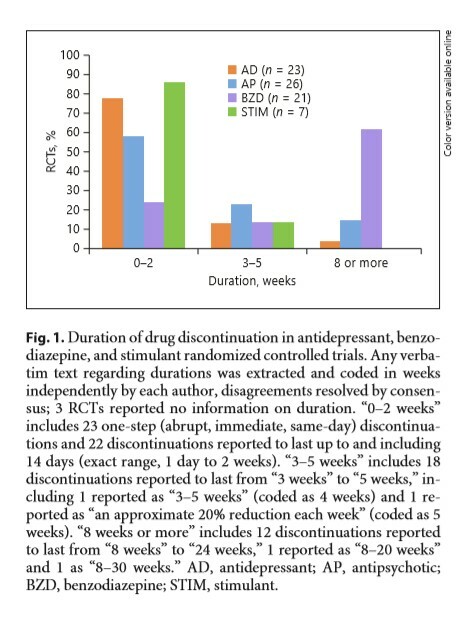 Psychiatric drug studies routinely use rapid discontinuation from drugs to test whether patients “relapse,” or experience a return of their psychiatric symptoms. However, rapid discontinuation can result in withdrawal effects that mimic “relapse,” meaning that withdrawal from the drugs could be causing the worsening symptoms. According to researchers, withdrawal symptoms from psychiatric drugs “may include anxiety, depression, mania, and psychosis, in addition to nausea and vomiting, tachycardia, lightheadedness, and diarrhea.” This is not an exhaustive list; many other symptoms have been reported. Researchers David Cohen and Alexander M. Récalt, both at UCLA, wanted to discover how pervasively drug trials use rapid discontinuation practices; they also wanted to analyze how much data about relapse might be confounded by withdrawal symptoms. To that end, they conducted two studies, both published in the journal Psychotherapy & Psychosomatics. In the first study, Cohen and Récalt identified all the randomized, controlled trials that featured psychiatric drug discontinuation practices (published since 2000)—a total of 80. They then determined the discontinuation procedures used in these studies. 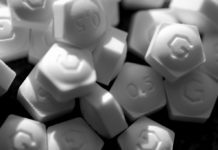 Perhaps because the harms of benzodiazepine withdrawal are well-known to the public, trials of those drugs typically tested long discontinuations with supportive practice. The majority were tapered over eight or more weeks. In 67% of all trials, the authors gave no reason why they used any particular discontinuation period, which rose to 78% in the 23 trials that used abrupt (same-day) discontinuation. Only 12 of the 80 trials even mentioned the possibility that any discontinuation could have resulted in withdrawal symptoms confounding their results, and five trials tried to analyze such a possible confound. A double-blind procedure is a standard in drug trials—it ensures that neither the participants nor the researchers bias the findings by knowing whether they are taking the placebo or the active drug. However, only about half of the studies here used a double-blind procedure, and of those, only 12 provided adequate information about how they used that process. Not a single study checked to see if their blinding methods were broken (i.e., asking participants if they figured out whether they were taking the drug or the placebo). In the second study, Cohen and Récalt wanted to determine how withdrawal symptoms might confound the results of these trials. That is, how much of the “relapse” that the drugs were preventing was actually due to withdrawal symptoms caused by coming abruptly off the drug? The researchers note that, according to previous literature, if returning psychiatric symptoms occur quickly after drug discontinuation, it is likely to be due to withdrawal effects, whereas if symptoms return more slowly, they are more likely to be due to relapse. For this reason, they analyzed the studies on drug discontinuation to determine when the symptoms returned. Thirty of the original studies were included in this analysis. However, only 12 included enough information to be analyzed. Cohen and Récalt reached out to the other study authors; only two additional authors provided data. The remainder either didn’t respond or said that their data was “unavailable.” Because of this, only 14 studies were included in this analysis. After examining the data for how quickly psychiatric symptoms returned after drug discontinuation, Cohen and Récalt concluded that a high proportion of results were confounded by potential withdrawal effects. Around two-thirds of the studies were likely to have this problem. In reality, of course, there will be no psychosis if you rapidly stop taking antipsychotics. Nobody even takes them after hospitalization. But if you tell the doctor to treat his patients with marijuana or you will not go to the hospital at the appointed time, they will write you a second psychosis in the medical card. That’s where such statistics come from. This is such a shameless lie. And if you think that such cases are rare, then you are deeply mistaken. There is a real confrontation happening. It is also completely incorrect to put stimulants, antidepressants and antipsychotics in one row. Since people often give up their freedom in fight against antipsychotics. 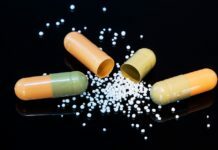 There is a withdrawal syndrome attached to “antipsychotics” and it is very difficult to come off these drugs even with a careful drug withdrawal program.”Antipsychotic withdrawal syndrome” is medically acknowledged but the extent of the problem is not. When I complained about the disabling side effects of the drugs (above) I was given the option of discontinuation ; and was to experience 4 hospitalizations in the next 5 months, which were classified as Relapses. But I eventually did come off the depot injection in 1984 through a careful taper with oral medication, and successful “Psychotherapy”; and regained my capacity to work and become fully independent. for years afterwards, until they eventually disappeared of their own accord. Nonsense. Psychotropic drugs CAUSE the damage that is then misinterpreted as “mental illness.” Psychiatry is a pseudo-scientific system of slavery that masquerades as a medical profession, and psychotropic drugs are not in any way, shape, or form medications. They are dangerous, brain-destroying chemicals. The mendacity of modern medicine combined with pervasive ignorance in the general public leads to studies such as the one mentioned in this article. They do change the brain and cause “mental illness”. I refused drugs happily at the start but after consuming them for some years, I was incapable of stopping without a lot of help. I think if a person can successfully come off drugs and recover (after years of disability benefit dependency) this proves that the non drug approach is what’s suitable. Thank you. I have really enjoyed the article, but I do have to disagree that dangers of benzo withdrawal are well known to the public. Yes, they may be well-known to psychiatric patients who take them, but there is very little out there outside of benzo survivor communities that communicates some of the less obvious issues yet just as equally disabling outcomes from them. Not many people in general public have even heard of the Ashton manual and generally have no concept of how benzos really work, other than that they initially seem to treat the conditions they are prescribed for. Also, a lot of benzo patients have or had taken other psychiatric drugs: mood stabilizers, antidepressants, beta blockers, antihistamines, antipsychotics, etc. Before I was prescribed a benzodiazepine, I was just one of those antidepressant users who was told that I should never really go off of them, but needed to stay on a maintenance dose (typically 1/2 of the normal dose) to prevent a recurrence of another depressive episode. That’s what had been drilled into my head many, many times. I agree, very few non-medical folks know anything much about benzo withdrawal. Many have been told that benzos don’t create dependence if used as directed, in direct contradiction to the published product information. There is a lot of misinformation out there. It seems more common in the UK.